Before hitting the water with your pet, it’s important to plan ahead. Boating with your pet can be a wonderful and bonding experience. • Identification tag: Make sure your pet has a collar with an identification tag. • Familiarization with the boat: It is best to gradually introduce your pet to your boat and the water. Let your pet explore the boat while it is docked before going out on the water. Turn on the engine and let them get used to its sound, smell, and feel while the boat is docked. Finally, take your pet out on small cruises and gradually build up to longer cruise. • Safe and easy boat access: Provide a pet ramp for your pet to get on and off the boat. This not only includes from the dock to the boat but also from the water to the boat. Pets weigh more wet than dry and it can be very difficult to lift them back into your boat after a swim. 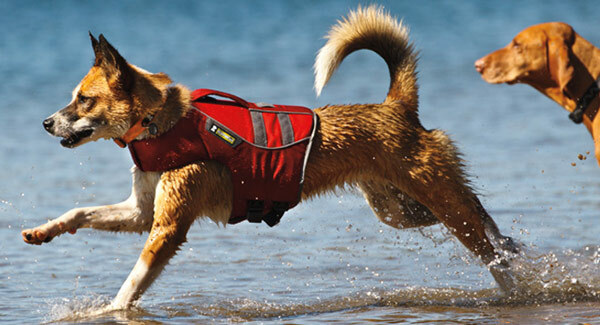 • Flotation device: A pet life jacket can also ensure safety while on the water. Even if your pet is a good swimmer, getting tossed overboard can put any animal into a panic. Having your pet equipped with a flotation device with a lifting handle makes retrieving your pet much easier and safer. • Proper hydration and staying cool: Protect pets from heat by providing some shade on the boat, providing plenty of water and keeping the deck cool to protect paw pads. Bring along a pet travel bowl and fresh water. It is critical to hydrate pets before they get into the water. Otherwise, they will drink the sea water and may get sick. • Going potty: A big challenge of boating with your pet is making provisions so that they can go to the bathroom. If your boat trip does not allow for regular land stops for your dog to do their business, then provisions must be made so that they can relieve themselves on the boat. A portable dog potty that simulates grass is an excellent solution. • Health records: If your boating destination is a marina or place that you’re not familiar with, be sure to bring along a copy of vaccination and health records. Some places may require proof of immunization before letting pets explore on land. • Call ahead: While most marinas and parks welcome pets, there are some that aren’t pet friendly. Be sure to call ahead before arriving on shore. Wishing you and your pet safe and happy travels on the water this season!